Feel free to purchase high-quality chicken stock to use with the cooked chicken breasts instead of homemade broth. In a large stockpot, combine the chicken parts with the broth, sprigs of rosemary and thyme (or dried), garlic, carrot chunks, celery chunks, and coarsely chopped onion, and coarsely ground black pepper. Bring to a boil. Reduce heat to medium-low, cover, and simmer for about 1 hour. Strain broth into a bowl. Cover and refrigerate. Put chicken in a bowl. Cover and refrigerate. When broth has cooled, skim excess fat off the top. Measure 6 cups into a separate bowl. 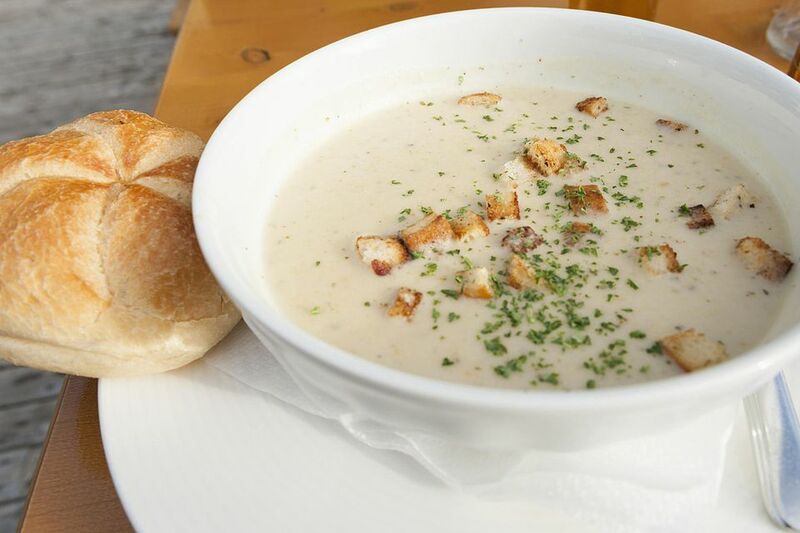 Set aside until you need it for the soup. Dice chicken breast and transfer about 2 1/2 to 3 cups to a bowl. Cover and refrigerate until you need it for the soup. Refrigerate or freeze the remaining chicken for another use, such as a casserole or chicken salad for sandwiches. In a large saucepan or the same (cleaned) stockpot, melt 1/4 cup butter over medium-low heat. Add minced shallot, diced celery, and diced carrot. Sauté for about 6 to 7 minutes. Add green onion and sauté for 1 minute longer. Stir in flour until well blended. Continue to cook for 2 minutes, stirring constantly. Add the 6 cups reserved chicken broth to the flour mixture. Cook, stirring frequently, until the minced vegetables are just tender, about 10 minutes. Add the peas and diced chicken breast. Continue to cook for about 5 minutes longer. Add the heavy cream and stir to blend.